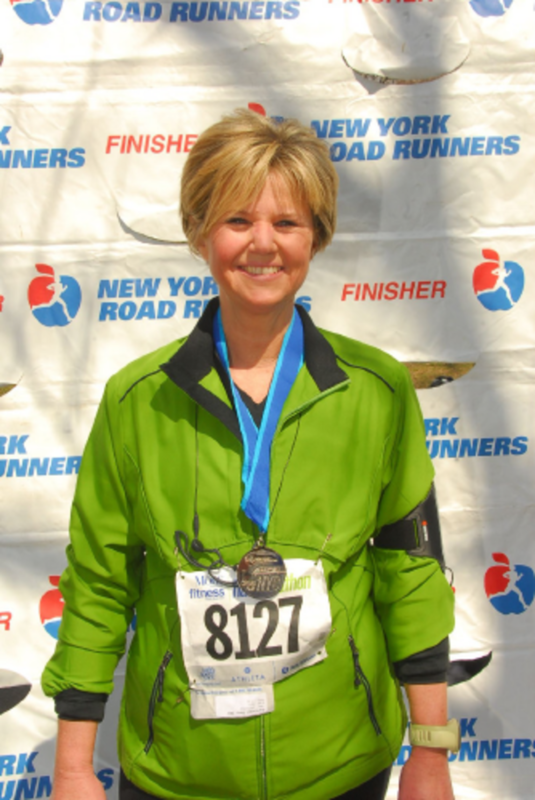 Anne is a non profit executive and has finished 6 half's and 1 full marathon. The first thing you want to do is register for the half marathon. Pay the registration fee, order the shirt if they offer that option and then let everyone you know in on your decision. 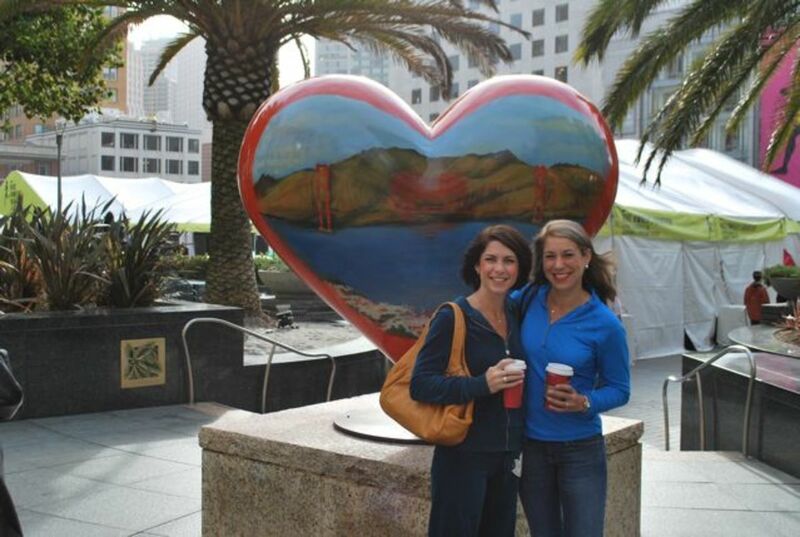 I like to blog, so I did throughout all six half marathons. Love it! Begin your training at least 12 – 16 weeks out from the event with walking/running every other day. 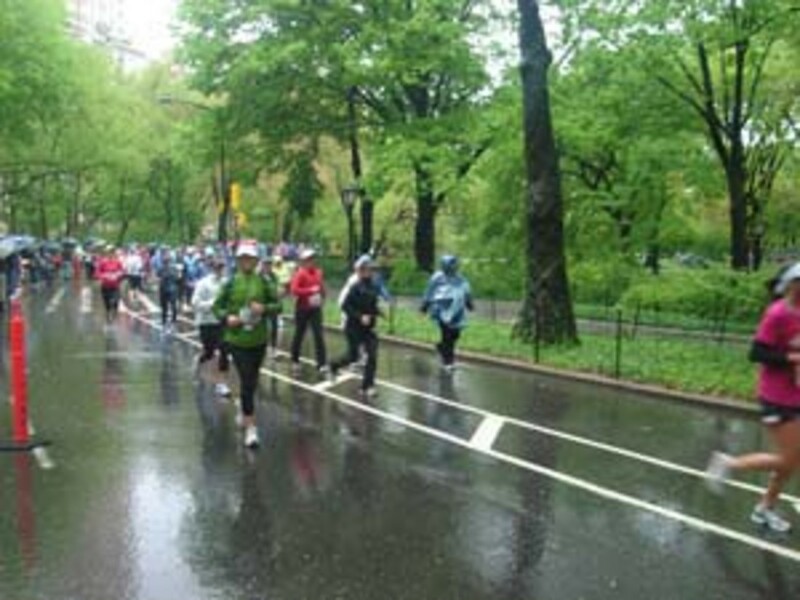 To run the full half marathon, you need to comfortably be able to run 3 miles before beginning a training program. Therefore, if this isn't you, plan on walking with some running. Your goal for the first half marathon, is just to finish. There are many plans available - based on your fitness level. Here is the plan I followed for my first half marathon with some additional improvements. Get checked out and cleared to begin the challenge. Schedule additional visit for 2 weeks before and another 2 days after race. Pay special attention to your heart rate and ask your doctor about your target heart rate and advice specific to your fitness level. Be sure to share your training plan with your physician. Be consistent and fight to get your walk/run in according to the training schedule. Your commitment to the training is critical to preventing injury. Also know, people do die from attempting a race like this when not fully prepared. Sometimes there are undiagnosed underlying issues that surface due to stress of physical exertion. Thus another reason you need to stay in touch with your doctor. If you are serious about finishing the race, you must train, especially if this is your first. Don't skip your training. Even if traveling, take advantage of the hotel's (usually) awesome gym and it's a great reason to get up early and get going. I even squeezed a run in while visiting out of town relatives. I'd dress for it and then have my husband drop me off a few miles from our destination. When doing the long run practice with all of the gear. This will help you think through what you really need and what you can’t manage. I used the Camelbak during first half marathon. However, the second one I chose to just carry a water bottle. I didn't want the added weight and restricting straps. It worked okay. Also, if your race is in cooler weather, less water is needed. The more stuff you have on, the more you'll be distracted and have to manage. I now only run with my smartphone, a belt that carries keys/Gu, etc. and a water. The events I've been in thus far do a great job marking the miles and giving you the time, so I nixed the watch. Know well in advance though what you plan to wear and don't save it till that day, be sure to wear it so you will know how it feels while you run/walk. Don't wear anything that's brand new. Time or pace yourself to hit the pace you want to achieve at the race. If this is the first time, your goal should be just to finish the race. Once the time limit has passed, there is no official documentation that you finished. Be sure to get in under the clock. Know what the deadline is for such. For my first half marathon it was 4 hours. I made it...barely. If you are wondering how many don't make it? In my first race there were 3,600 (30%) that didn't cross the finish line. Download the map of the course. This has been the map for the last several years for the More/fitness Half. Plan where you will make bathroom stops. They actually show such on the map as well as water/sport drink pit stops. Know from training how long you can wait but also allow for time for lines. 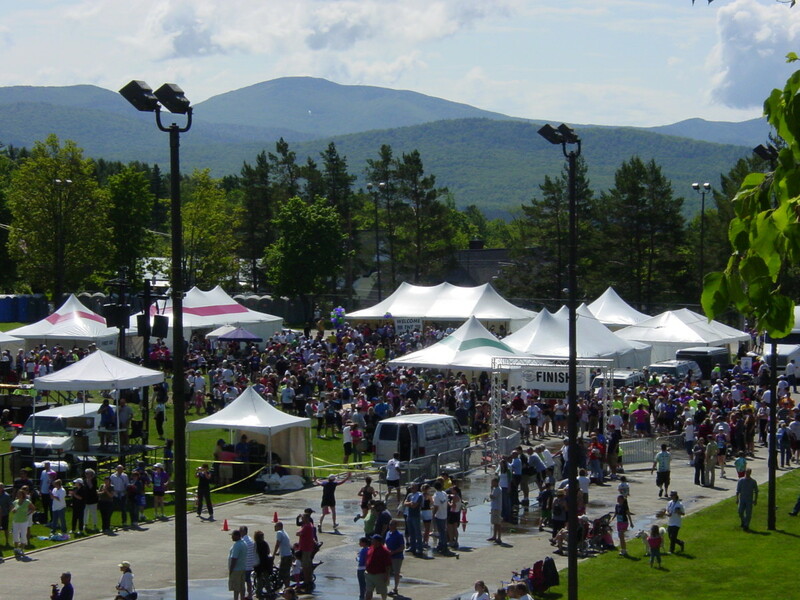 There weren't any long lines at the bathrooms – maybe 2 – 3 people. Early on the stops will be cleaner than later, due to problems other racers have with such. Be very aware of your time – don’t stop too much. Also remember to use the restroom 15 minutes before the start of the race. The slower you are the more stops you will make. My last half marathon I finished just under 3 hours. I didn't stop once. If you are like me, and from out of town, stay at a hotel that is within walking distance of the start of race. 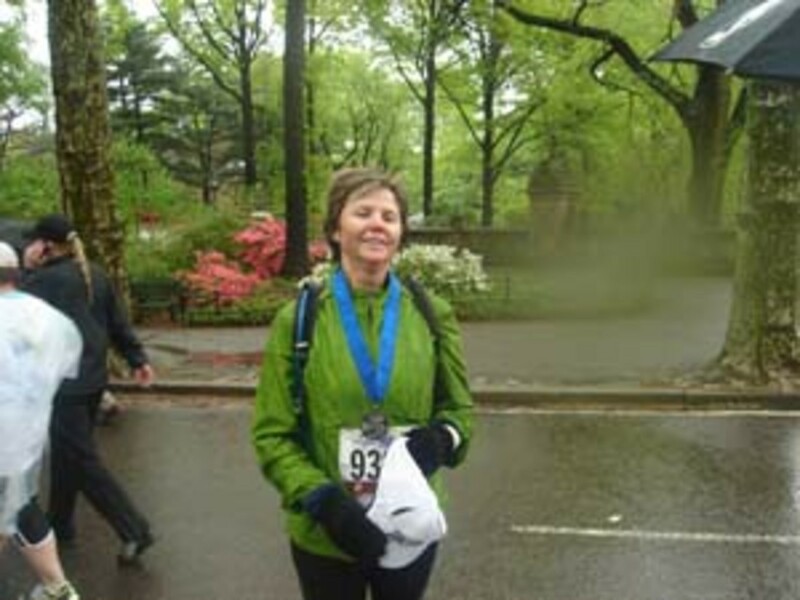 Most of the half marathons I've participated, were in New York City and started at West 63rd street in Central Park. I used the walk from the hotel as a warm up – it was a little over a mile. 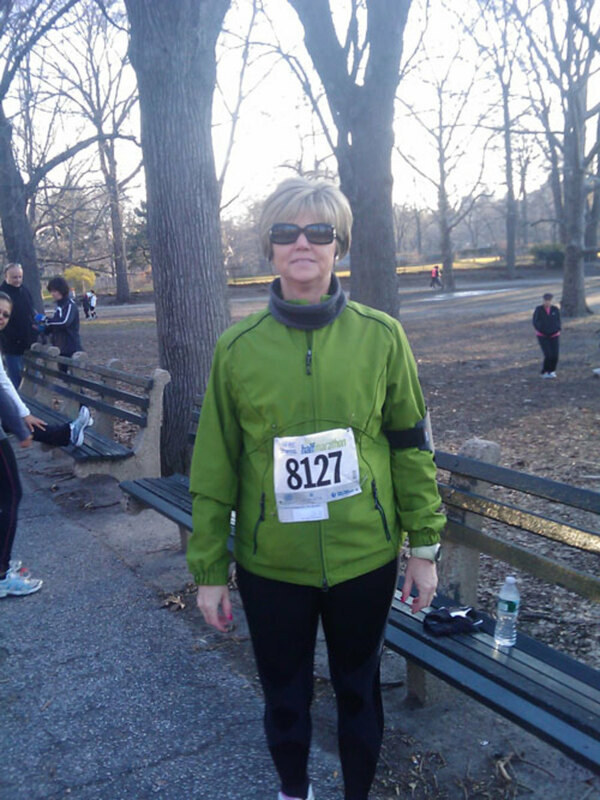 After race I walked to East 72nd Street (about a half mile) and caught a cab back to hotel. See Map of area. After my first long run on an 80 degree day. Cooled down in state capital building afterwards. Go to a running store and ask for help to get the best possible shoe for your foot, based on your arch, etc. Be sure to get a size larger than you normally would purchase. This is important for running. One problem I can't seem to get away from is that I still continue to get bruised toes – turns toe nails black for 6 months. I've purchased so many different shoes and sizes yet still finish races/training with such. Buy some moisture-wicking running clothes – Under Armor is one brand, there are several. They have underwear, shirts, shorts etc. This will help body temperature too. A must for your race. Get moisture-wicking socks – very important. Most athletic stores have them. Then apply Glide lubricant to feet and around toes. This will prevent blisters. You must stay hydrated. I purchased a Camelbak which holds about 16 ounces of water. It has a small tube that you just uncap and drink from – very easy. Now, I just carry a water bottle and only use the Camelbak when I have long runs of 10+ miles on a trail. You must drink (depending on pace and outside temp) 6 -8 ounces every hour. If you use a water bottle, refill it at water stations. You will need to take in some salt too. Just have a couple of salt packets with you. Take one or two during race - This will prevent a condition called Hyponatremia. When negative thoughts enter your mind…end all of them with “…it just doesn't matter.” After you hit mile 7, 8 or 9, it won't matter because this is when my body would start to feel the impact of the distance. But always focus on the run and push out those thoughts - they can undermine your effort if you let them. Totally focus on the run and forget about bills, work and other issues that tend to creep into our minds if we let them. Visualize what success will look like and see it in your mind. See yourself crossing the finish line. Imagine all your family and friends running with you. Create 2 videos in your mind that will motivate you. You will be focusing on them during half marathon. During my first half marathon mile 6 and 7 and then again at mile 12 due to the cold, I struggled and used those images to make it past that point. It worked. The Northern part of Central Park was hilly and runners are more spread out at this point. I imagined my family running with me. I pictured my parents (both of whom have passed away several years ago) up ahead cheering me on. This is really important. I had my phone with me so I taped myself when I was struggling. I am so glad I did. It is a reminder to me of the impact of negative thoughts. When I uploaded it to YouTube the audio became out of sync with video. I call this my “12th mile madness” Click here to see. At about mile 11 and 12, I was losing my perspective on the race. I believe I was so cold and wet that I was experiencing some effects similar to hypothermia. Hypothermia can hit when your body is exposed to cool, wet conditions for too long. I actually didn't know that I was possibly suffering from such until afterwards. 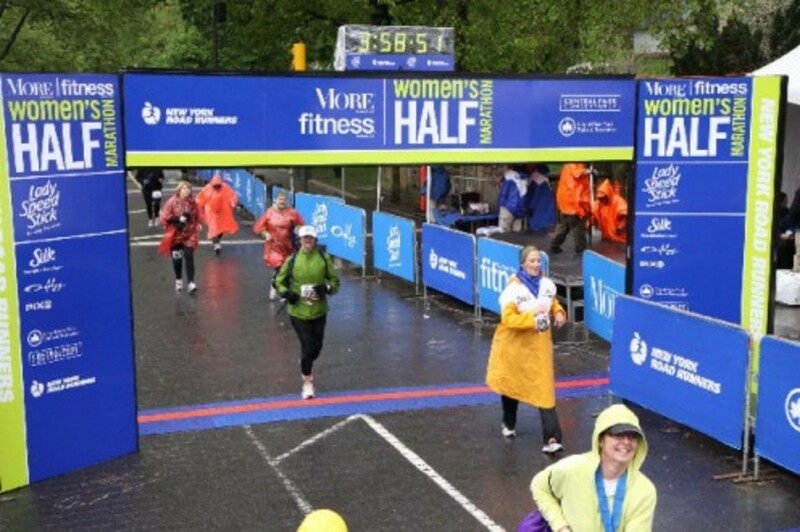 If you ask anyone or find a blog online of the 2010 More/fitness Women’s Half Marathon, they will usually describe that race as “brutal " due to the rain and cold. Several runners were treated for hypothermia including those that placed in the race. According to Mayo Clinic, Hypothermia is most often caused by exposure to cold weather or immersion in a cold body of water. Primary treatments for hypothermia are methods to warm the body back to a normal temperature. When the body temperature falls below 95 degrees many of your organs have a difficult time functioning. It can be fatal. Instead of the typical ice soak that is recommended after a race (have yet to do an "ice soak" sounds awful), I took a warm shower for obvious reasons. I had a lot more swelling due to such, but I needed the warmth. My clothes were completely soaked before the 3:50 race began. At mile 6, I added gloves but they soon became soaked too. The rain and cold really slowed me down. I couldn't stay warm before race after walking around, stretching jumping up and down, etc., I injured my knee early in event because of stiffer muscles as well as downhill running (Central Park has many hills), took more bathroom breaks, the more you wear, the longer it takes to use restroom too. The slower pace caused me to be exposed to elements longer. I didn't train much in the cold – I have since begun that practice. I learned a lot. I use hand warmers more for training. Usually, if the race is in cold weather, I only need them before the race and maybe the first mile, then my hands warm up as the rest of my body does since I am now running the whole race. Rained the entire time before and after start of race. Completely soaked with 37 degree wind chill. Be sure your foot hits the ground –heel and forefoot hitting together. Go to running store and some have ability to video tape your feet in motion. They will use that to determine shoe. Some also offer running clinics. Join if you have the opportunity. Form is very important. Most of your energy should be used to propel you forward. If object in front of you is moving up and down – then too much vertical motion is occurring and your running is not efficient. Upper body should be slightly tilted forward and arms swing forward don't carry them to high either. This will also help neck and shoulder muscles keep from tensing up. Relax - be completely aware of the muscles in your shoulders, back and arms. Don't tense up - you should be very relaxed as you run.Running is like falling forward. Your foot should also stay under you knee. To get this sensation, lean forward until you start to fall, your foot will automatically step forward to catch the upper body. That is the natural running form essentially. Falling forward fast. I breathe with a 2:2 pattern. Two breaths in and two breaths out. This is a very efficient breathing pattern for runners but will take practice. It took me a little while to get used to this pattern but it really did help once I did. I run with my mouth open and breathe through both my nose and mouth. I still struggle with my lung capacity. Not sure why. There are exercises online you can easily preform to help increase such. Bruce Lee believed great lung capacity was key to being a strong athlete. Don’t do all of your running on treadmill. Treadmills will stress the same points on the legs. When running downhill, run as if you are falling forward. Also use exercises like leg extensions to strengthen muscles around knees to protect them from injury. Downhill running is very hard on knees and is how I injured mine during first race. You'll need to work on all muscle groups in your legs. Also to prevent shin splints, I lay on my back, lift one leg 6 inches off the floor and write the alphabet with my foot in the air. You'll feel the burn in your calf and shin area. Then do the other leg too. Shin splints usually occurs if you increase running distances too quickly. Train indoors and out-doors but be sure to guard against injuries. Try to run on even pavement or ground with no dips or holes. Don’t leap over puddles or rocks, run around them. Also, if the race is outside, you'll want to run on similar surface as the racecourse. Asphalt is softer and more forgiving than concrete. Run on asphalt if you have a choice. Most courses have hills – not a lot but enough to cause you to integrate into training. 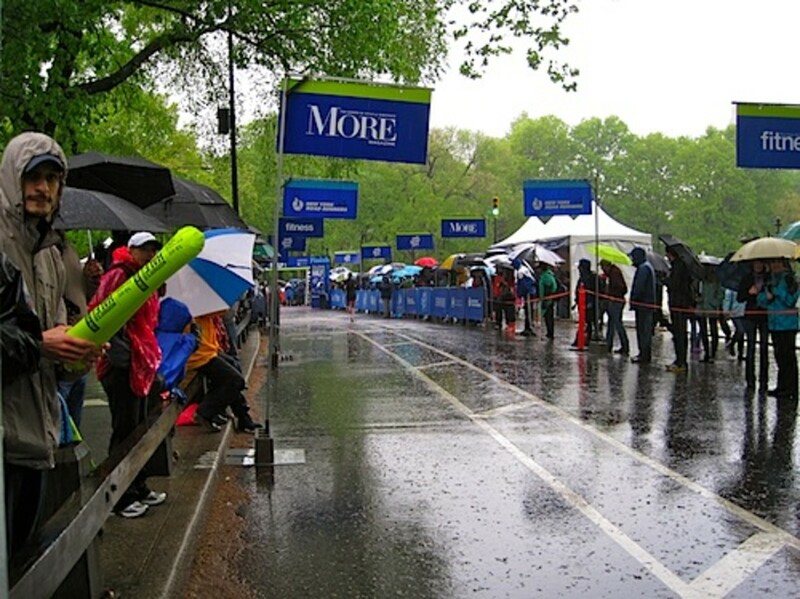 Visit Course: The day before race, walk around the course with the race map. I did this so my son and husband could figure out the best vantage point for them. I also walked to race start and area where the finish line would be, to get a perspective of both places. Schedule: Cross train on off day – lots of leg extensions and bike riding. Weight Training: Strengthen knees, legs (very important) and upper body with weight training. Stretching: Do dynamic stretching exercises after your run/walk not before. Use a 15 minute walk or slow jog as your warm up. Don't stretch before. Your muscles are cold and you'll injure them. Also, afterwards and a couple of times a day I would do an IT Band stretch or better yet use a foam roller. After Long Runs: Keep moving for several minutes. Do not just sit down or collapse. Two Weeks Before: Taper down exercise the following 2 weeks after last long run. Week Before: Last week run just 1 or 2 miles, Tuesday, Wednesday and Thursday but no more after that till event (assuming it is Saturday or Sunday). Hydrate: I drank 6 -8 ounces of water every 60 minutes. Probably was more than needed since it was so cold. Glycogen Needs: I supplemented with Gu (athletic stores sell them in many flavors - I stuck to Vanilla) Gu is easier for your system to absorb than some other snacks and cause less problems. Everyone is different though so you'll have to figure this out for yourself while you train. Take 1, before race and then every 4 miles after it starts. Afterwards: After long runs (more than 7 or 8 miles, I had a sport drink. You need to refuel immediately after long runs and of course the race. This helps with recovery. Don't over-do-it though. Fruit, bagels, yogurt, chocolate milk, sports drink are all good choices. Then I would wait to eat anything else for 2 hours. Slowly reintroduce other food back into system. Drink 4 – 6 oz water every hour. No alcohol or caffeine no high fiber- Have a good dinner with plenty of carbs including salad. Set out race day clothes and supplies. Get two outfits ready for the race: One for cold weather and one for warm weather if either is possible. See list below. Pack stuff in Camelback pouch or get a belt with a pack. Pin the race number to the shirt and attach the timing chip to the shoes. You’ll need four safety pins for race number. It has to be on outside so easily seen by race officials. Camelbak Pouch – 6 packs of Gu, phone, Chap Stick, tissues, sunglasses, Glide. Eat a high carb breakfast @ 5 am. 1 hour before, walk around staging area (walked to race from NY Hilton. Thank the event sponsors for putting on such a well run event. Think about crossing the finish line, positive mantras, visualization, prayer, etc. Race photographers were closer to the end of the race and at the finish line - remember to smile even if you don't feel like it. Walking and stretches are important now especially. Drink a lot of sports drink then 4 – 6 oz every hour. Get cab back to hotel. Rest and no more food for 2 hours. Carb snacks after 2 hours. Then slowly reintroduce other food. I followed this and didn't have any problems. It takes 2 weeks to fully recover from a half marathon – 1 day for every mile you ran. I learned this from a member of the New York Road Runners Club. Of all the reading I did, that was something I did not come across. I wasn't prepared for the after race impact on my body. After 24 hours passed, bruising began appearing on sides of my thighs and hips. Doctor said that was just from unusual stress to those muscle areas. It went away as did swelling and other after effects. No bruising after other races since and very little swelling - just the first one. To give my injured knee support, I purchased a knee brace and wrapped feet (arches) and ankles with ace bandage for support (again - only first race issues). Your immune system really takes a hit from the race. So continue taking vitamin supplements and increase vitamin C. Also drink a lot of fluids. Stay away from anyone that is ill and use antibacterial gel generously. Since your body is recovering you are very susceptible to illness during this post recovery period. I was so cold in this pic - couldn't wait to get out of wet clothes. Pace yourself so that you have gas left in the tank for the final miles. Speed walk through the water stops. Visualize success – positive mantras, visualize family and friends running with me, visualize crossing finish line, play back positive video in head. Write your name on shirt or wear something unique so others can spot you. I wore green jacket. Dress according to the weather. You might wear a long-sleeve shirt over your T-shirt or singlet and toss it later at an aid station once you warm up and the temperature rises. My second race I did this and should have taken my jacket off too but didn't want to lose it. It's become my "lucky jacket." Keep hands and head warm. If it’s colder than predicted (say around freezing), wear gloves with mittens over them for extra warmth. Some runners wear tube socks (with the toes cut out) on their arms for added warmth. Don’t wear anything that is brand new. Everything needs to be broken in for the long run. Lubricate. In a marathon, it is especially important to lubricate any areas of the body where there could be friction against the skin. Use Body Glide to prevent chafing or blistering. Also use a lip balm before the start of the marathon to keep your lips moist. I only had to use this once. Camelbak – had plenty of water for race and supplemented with sport drink sponsors provided at pit stops. A water bottle will probably be enough though. Glide is an anti-chaffing rub I used this on feet to prevent blisters also anywhere that clothing rubbed. See packing list for complete details of what to bring. I took a lot but am really glad I did. Was preparing for hot weather but brought clothes for cold too. It was unusually cold with a lot of rain. If it's above 50 degrees wear shorts if below 50 dress warmer. I wore CWX tights - they are the best. For out of town races in particular, don't wait until the night before you travel to collect and pack needed items. Rather, make a list of things you wish to take and begin getting them together in the days prior to your departure. Plan for all types of weather as conditions can change rapidly. It's better to pack everything you might need rather than having to scurry around a new city looking for clothing and/or accessories at the last minute. 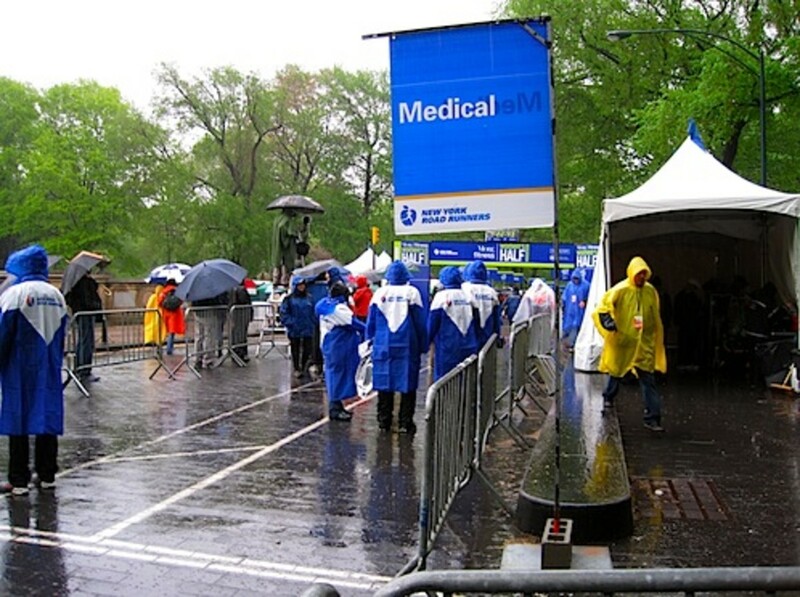 Carry bottled water with you if you will be flying to your marathon destination. Flying at high altitudes can contribute to dehydration. You should drink 8 ounces for every hour in the air. Be very conscious of your hydration and nutrition days before race. It is extremely important that the running shoes and apparel you plan to wear for the marathon are packed in carry-on luggage so that in the event your baggage is lost or delayed by the airline, you will at least have these "essential" items with you. Rolling clothes instead of folding is more efficient and things don’t get as wrinkled. Print boarding passes out night before and place in holder that hangs around your neck (one less thing to have to handle). Camelbak or insulated water bottle. Plastic sandwich and storage bags for ice bags after race. *food and water was purchased there. I kept it on the list though as a reminder. Before my 2nd half marathon. Run your race with all your heart and see how it impacts all the other aspects of your life. You'll never want to stop. To see more information and find out where to get all the items mentioned in this article, visit my blog at www.asicsmom.com. Thanks for reading and good luck with your race. What is the longest race you are willing to run? Congratulations of your accomplishment! I am working my way to doing a 5K. Up until now I have focused on body transformation and just recently done more cardio work indoors. I started running about 3 weeks ago and hope to do my first 5K early next year. Your hub was quite inspirational! Here’s what I would do if it were me – I’m no medical expert though so you should also see your doctor to rule out stress fracture and other injuries. After your doctor visit, if it is shin splints, you need to help your muscles heal. It sounds as if your conditioning, stamina and endurance should be close to optimal levels. You’re almost at the point where you should be tapering down to ensure you’re ready for race day. Hopefully you are following a plan that has the taper that begins two weeks prior to the race. Something I practiced with any injuries was called RICE (rest, ice, compression & elevation). I also incorporate some targeted stretching to prevent them. I would lay on my back twice a day with legs stretched straight and 6 inches off the ground (one at a time) and write the alphabet with your toe in the air. Also, here’s a video of some strengthening exercises. If it were me, to ensure endurance remains high, I would incorporate some circuit or cross training with low impact movements to again, provide as much rest as possible for shins. I also took anti inflammatory meds like Advil to help with inflammation & potential swelling. Ask your doctor if you can take Advil and what your dose should be. Thank you Anne! I just signed up for my first half marathon and have been reading alot of info online. I really appreciate the information you have shared. Great job Anne. This is a great guide for anyone thinking about running a half marathon. Congratulations. Hi Mariann - Your first half marathon is really exciting. You must be in full swing with training right now. I ran my first marathon this year and the first time I hit mile 15, I got that drunk/lightheaded feeling too. I made more effort to breathe in through my nose and out the mouth. Also, I eat "Gu" every 4 miles (vanilla) isn't too bad and water alternating sport drink every 7 or 8 miles. I am not sure but I think the light-headedness is due to lack of oxygen. It will get better as your body adjusts. Be very aware of your breathing though. This summer I almost stepped on a snake because I couldn't react quick enough. Fortunately it was half dead or I would have been bit. Good luck to you! Awesome information !!! I am doing my first 1/2 marathon at the beginning of March. My question is what types of snacks if any should you bring? I know when I am in my 6-7 mile while I am training I feel like I am drunk and get lightheaded. My friend recommended vitamin water and some almond butter packets, what do you suggest ?? Thanks for the great feedback and for stopping by my Hub. My first half marathon was life-changing. I hope others read this and are inspired to run their first half. I just ran my first full marathon in October of this year and it was an awesome experience. Once you start running you'll never want to stop. I'm going to write about that experience too. I'm thinking about a title...any ideas? Michelle let me know how your race goes. Good luck to you! Thanks for GREAT information and for GREAT inspiration. 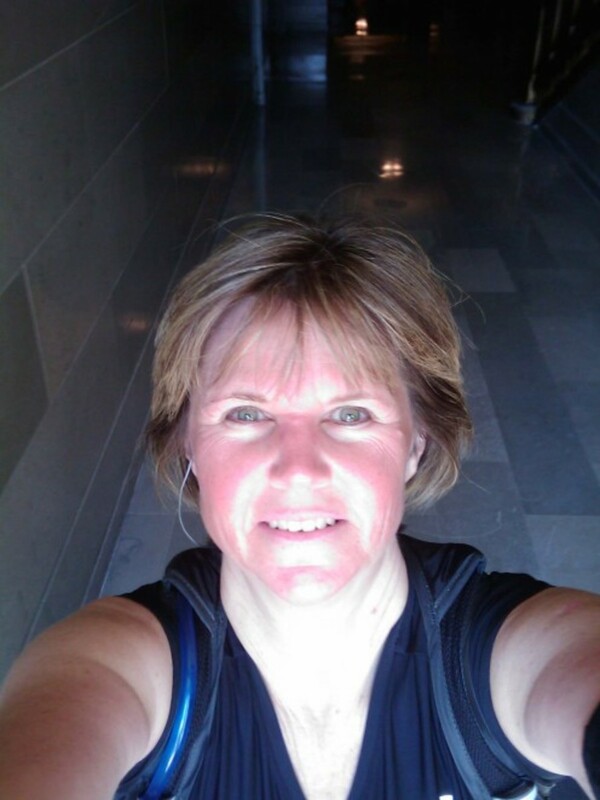 I am over 40 and have just signed up for my first 1/2 marathon. After spending hours reading your blog and information...I now have a "I can do it motivation." Now that's an excellent guide! I'm a longtime runner and I picked up some good pointers. Thanks Anne and good luck with your upcoming halfs! First off, congrats! I did a half marathon many years back with very short notice, and on a muddy course. It was actually for a fundraiser. Had I known a little bit more, I could have prepared myself better, but instead, I ran the half marathon wearing a 2 liter camel-back full of beer. Great memories though, and completing something like that ends with a great feeling of accomplishment. Humans are one of the only creatures that can run distances like that. Wow excellent guide for newbies. so informative, lots of thought went into it. Clear and concise...Definitely worth the read!